As Michael Keating reported in American City & County, Economic Modeling Specialists International (EMSI) predicts that “the number of purchasing managers employed in governments will shrink” throughout the next five years.” And though another recent report indicates rising optimism about the skills of the acquisition professionals, there are only so many hours in the day to manage the oh-so-many solicitations and contracts crossing buyers’ desks. While the rise in skilled workers means fewer learning curves and less downtime due to training requirements, without a rise in available workers (overall), agencies will lack the resources to manage both routine goods, services and construction procurements andlarge-scale government digitalization project procurements in the coming years – and there will be undesirable consequences. When there is an imbalance in the worker-to-workload ratio – with the number of requested solicitations and active contracts far exceeding your team’s capacity – employee morale will plummet and so will your headcount. If you want to ease the burden of rising procurement demands, and retain your quality workers, you must make procurement technology purchases a priority. If you invest in the right technology tools, you will have the ability to eliminate cumbersome processes that waste buyers’ time and lead to more spending waste. A best-of-breed procurement system will introduce new efficiencies in everything from vendor management to sourcing and contract lifecycle management to audits. A well-designed and, more importantly, well-integrated eProcurement system will not only streamline procurement processes – including collaborative actions between customers and finance – but it will remove the busy work that compounds an already grueling and grinding procurement pace (and often that scare off talented workers). This newly published playbook will give you step-by-step directions on how to procure an eProcurement system, including advice on how to secure C-level approval for a best-of-breed solution. Download now. 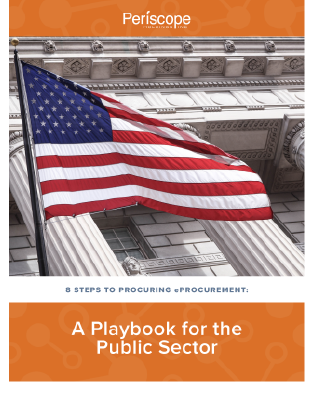 Many federal, state, and local government agencies are in dire need of end-to-end procurement overhauls. However, most agencies are resource-strained and struggling to make incremental process improvements much less execute large-scale modernization efforts – probably even yours. You simply can’t afford to pull your buyers away from everyday solicitation and contract management tasks to focus on more strategic activities, such as the identification and implementation of industry best practices. That is why is why third-party consultants are being tapped more frequently to meticulously review agencies’ operating environments at regular intervals. They can make both operational and technical recommendations and facilitate meaningful changes with minimal involvement from internal agency resources. For example, consultants can offer expert guidance on how your people, processes, and technologies can – and should – align in order to achieve immediate efficiency gains and long-term ROI. They can also implement modifications to processes and technology structures that will immediately improve compatibility, eradicate waste and help you gain more spend capacity within your resource framework. At the same time, consultants can conduct an unbiased audit of your entire procurement function and ensure compliance with government standards. It is hard to identify inefficiencies and waste – both in your purchases and your resource utilization – if you are trying to compile insights from paper-based records or disparate technology systems. Especially given that procurement professionals are heads down all day just trying to get the next solicitation, contract award, or modification out the door. This is just another reason why eProcurement systems are now mission-critical for public sector purchasing. They provide actionable data sets to inform purchase decisions and contract-related actions in real-time. Built-in audit trails can help you understand the outcomes of previous purchases – i.e. derived value – so that you can make necessary adjustments on subsequent RFPs to avoid repeating the same mistakes. And business intelligence tools prevent oversights related to vendor performance and spend, often auto-flagging issues that enable you to course-correct sooner than later – which budget-conscious and deadline-driven CIOs, finance directors, and customers will appreciate. Can Your Small Business Really Compete with “Big Businesses” for Government Business? Absolutely. Some say big businesses will always try to squeeze out smaller competitors in a bid to take over a particular market segment. You may just be concerned that a few big businesses seem to be winning every government bid in your target market, which reduces your potential revenue stream and shrinks your bottom line (and growth potential).